Offering warmth and comfort all year round, we've created a new fun and flexible accommodation option for young people on Sport and outdoor recreational holidays. With quick installation times, they have high specifications and are built to last. We can adapt the layots to provide outdoor learning centres or family lodges and the luxury glamping market too. 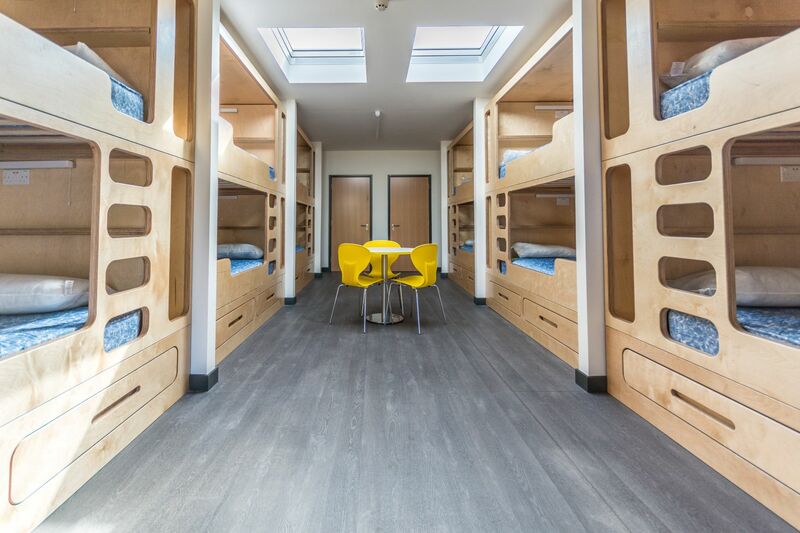 This project sleeps up to 70 people in 5 eco-bunkbox units. We presented an innovative speeded up timetable to the programme of works suggested in the original bid so disruption during term-time waw significantly reduced. The school requested a "Nature Learning Centre" located next to a nature reserve, the eco-classroom consequently incorporated bat roosting features, and a sedum roof. Headteacher Report: "We were looking for something really special - The project stuck to a very tight schedule and was completed exactly on time." "We needed to replace our existing mobile, with something to match our setting, be cost effective, top-specification and an energy-efficient eco-building." Commissioned by one of the top performing schools in the country - eco-classrooms designed and built a new print room facility to blend with their existing contemporary and historic buildings. We worked with the school to design a bespoke classroom with a unique interior layout. The space is divided into a classroom space and two further one-to-one or small group room learning spaces. A single classroom provision with spacious veranda area opening onto a safe enclosed incorporated playspace. The building blends well with the surrounding urban landscape, to provide additional classroom space. Our first London project was designed to blend sympathetically with the surrounding church, vicarage and school. A rural primary school that desperately needed extra space to accomodate the after school club and nursery school provision. As a registered eco-school they wanted to embrace a sustainable eco-friendly ethos. Great Dunham Primary School was a rural primary school severely lacking in teaching space. The school already had one existing mobile classroom but felt an eco-classroom would be a better investment in the future of the school compared to a traditional mobile classroom. An innovative extension to the main school. Predominately built off-site, we took care to adapt our standard specifications to meet the parametres of the main building. The pupils wanted an environmentally friendly solution and the school needed a quick build on a restricted access site. At Birtwick Park, we built a modern purpose-built specialist education learning centre, built using highly sustainable and recyclable materials, including FSC sourced timber. The project consists of construction of a new dance studio for the school, purpose built to Sport England standards and the relocation of an existing mobile classroom. The scheme provides both facilities for the school and outside user groups. Dereham Sixth Form College urgently required additional space to house an increase in students, and a shortage of study space had always been highlighted by the students as a concern. "The company's work at St Matthew's has been exemplary. eco-classrooms have proven to be highly adaptable and receptive to change throughout the tendering process and a pleasure to work with on-site throughout the build. The site presented with complications, which eco-classrooms solved capably and the craftsmanship and quality is exemplary throughout the building. We would definately consult and appoint Mark and the company on future projects..."